Love this! Thanks for modeling how to slow down and just be. It’s funny, because I live without a car and spend a lot of time in the 2-mile radius around my home office. It’s a pretty sheltered life, but it’s what I imagine the future will be like when we don’t have cars anymore. I appreciate your vulnerability and generosity of sharing this story with us. in the hills of Santa Cruz. And, truth be told, my car sits in the driveway most days. Thank you for gracing me with your visit and comment. This is gorgeous and intimate and vulnerable — I’m blessed by learning that Iris’s symbolize new birth at hand (as I look out at a yard full of them) — and I SO needed this right now! tears of gratitude – thank yous by the basket full – MUAH!! Oh a yard full of iris – how wonderful. I have some bearded in pots out back that have yet to bloom. 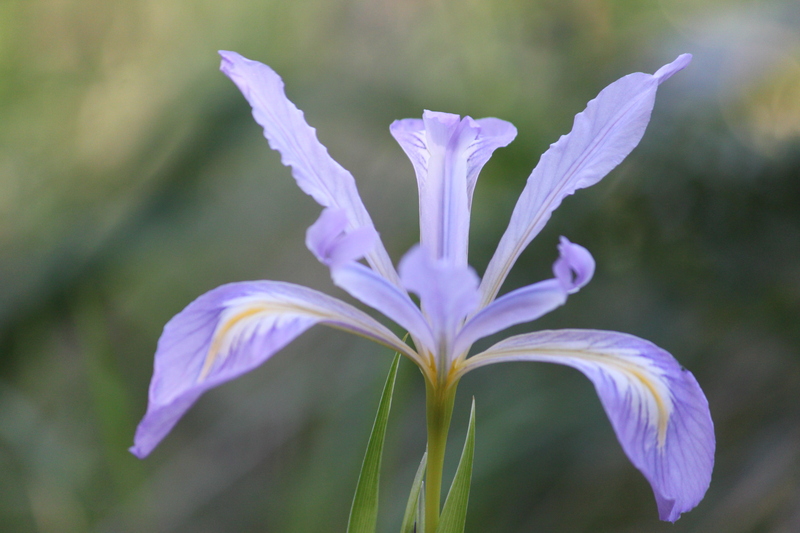 But our hills are full of white, lavender and deep purple iris these days. Thank you for your generous words and for taking the time to stop by Karen! I think that our entire system (body, mind, spirit and heart), is looking for opportunities to help us… if we just allow it and pay attention. And if we don’t, if reaches a point when it forces us to get there. It was my case: I hurt my knee a week ago, and I’ve been through a similar process to yours all these days (guiding messages from dreams and meditations, great insights and increased awareness about my life, deep emotional healing, etc.). What a wonderful system we have! Yes it is amazing and wonderful and I love how you pay attention, Gabriela. Thanks for stopping by. Lovely, you said it all. Thank you. Thank you Patrick – your compassionate support and presence is always a buoy in the harbor. Daisy! It’s always such a pleasure to bump into you here on Full Moon Path – thank you for taking the time and your kind words. I’m honored. wow, great post. i had never heard of lady antibellum before, great way to start this sunny post rain santa barbara sunday morning. you are right, we have all been there, and i am so grateful to be finally happily mated and not waking up at one a.m. with those feelings of longing for the unattainable other. brings back some intense memories though. wish we lived closer so you could share that dream with me on a beach walk, but your writings keep me feeling connected, with you and with myself. Karen – that would be wonderful – I see I never responded to your comment – here we are 3/4 of a year later and I’ve just had another profound dream about you know who – but this time, it was really clear that it was all about healing the masculine energy within me. Things cycle around I guess. Healing has its own sense of time.